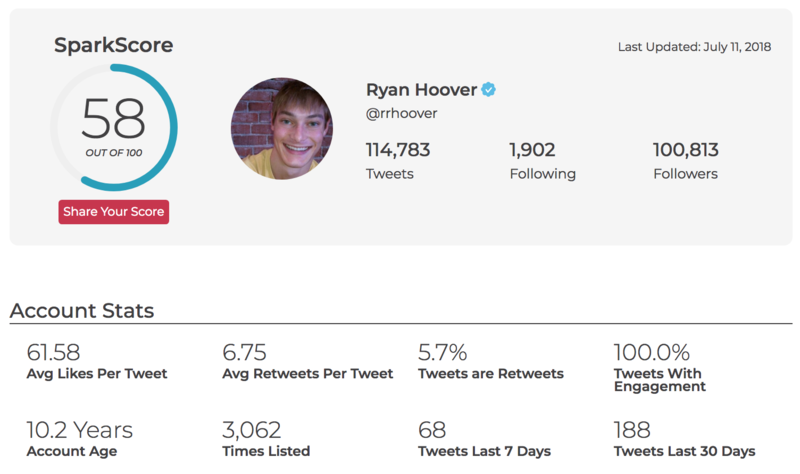 A New, Free Tool to Determine the True Influence of a Twitter Account | SparkToroNumber of followers is a crap metric. And yet, as I've been watching and learning from folks who do content marketing, PR-focused outreach, social media marketing, and influencer campaigns, I've found that more than 90% of the time... that's *exactly* what people use. Would you recommend SparkScore to a friend? Reveals the true influence of Twitter profiles. Shows how influence is calculated. I love Sparkscore already. It's a great way to find the true influence of Twitter profiles and hints at some more substantial tools coming from Sparktoro. It also offers a breakdown of how the score was achieved, and the specific elements (engagement, follower count, verified status) that contributed to it. Matt Aunger has used this product for one day. OAuth does not over-step. Plus, my score is a 4. Nice and low as it should be - I love that. I woke up to the PH email telling me how Rand Fishkin launched SparkScore and I went right for it because the man only makes quality products. He's got an excellent BS detector, so I trust his work. Sure enough, I land on SparkScore and find out my score is a "4" out of 100. With previous influence scoring apps, my score was in the 70's. That's so wrong! I am a business owner living in Pennsylvania - I should never have risen to the "70+ category"! One of my clients is a 94 (international sports figure), another is a 69 (writer for a national publication). These are both logical scores as well. After just a few hours I can already tell SparkScore will become the de facto standard for influence rank. Thank you, Rand, for making something real. SparkScore seems like it's going to be great and I can't wait to see what the future holds. David Hunter has used this product for one day. Just ran my stats (the full report includes a lot more than this): I'm curious how the volume of tweets affects these rankings. I would expect to see those that tweet more to depress engagement per tweet on average as the Twitter algorithm will only highlight 1 or 2 tweets in the "what you missed" section. Measuring engagement based on the number of impressions (not followers) would be a better measurement of "twinfluence" (sorry... terrible pun). The "related accounts" tab is what surprised me the most. Even tho' I'm not very active in twitter it did an amazing job highlighting related accounts that were extremely relevant! Great job @randfish & @caseyhen. Are you already planning an API for this? Lot's of integration opportunities here! Pretty good. But, more insights are needed. For e.g. custom suggestions on what can be done to improve the score. @digitaldebdut What exactly do you want them to tell you? Be more interesting? Tweet better content?